A native of North Carolina, Danny brings almost 15 years of experience to the position. He attended Asheville-Buncombe Technical College where he earned an Associates Degree in Tool and Die/Mold making. After college, Danny participated in the apprentice program at Alliance Carolina Tool and Mold where he received his journeyman certificate in mold making. “Danny’s overall knowledge and skills make him an excellent choice for this position, and in keeping with our policy of promoting from within the decision was obvious,” stated executive director Robin Cothran. Danny is married and has two children and currently still resides in North Carolina with his wife and family. He has worked at Tool Technology for over five years. Tool Technology Corporation was founded in 1988 by president Don Reid and provides complete manufacturing solutions to the automatic, electronic, medical and aerospace industries. 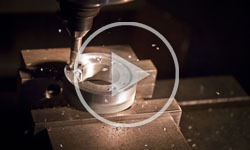 They do precision machining, tool and die and custom injection molding in their 21,000 sq. ft. facility.